Astronauts Thomas Pesquet of ESA (European Space Agency), Oleg Novitskiy of the Russian space agency Roscosmos, and Peggy Whitson of NASA pose for a group photo at the Gagarin Cosmonaut Training Center in Star City, Russia during qualification exams for their Expedition 50/51 mission to the International Space Station. 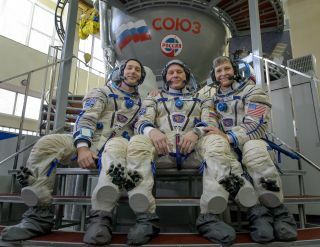 Three new crewmembers will begin their journey to the International Space Station today (Nov. 17) as they blast off on a Soyuz rocket, and you can follow their departure from Earth live online. The Soyuz MS-03 spacecraft carrying the Expedition 50/51 crew will lift off from the Baikonur Cosmodrome in Kazakhstan at 3:20 p.m. EST (2020 GMT). You can watch the launch live here on Space.com starting at 2:30 p.m. EST (1930 GMT), courtesy of NASA TV. In a press conference, Whitson and Novitskiy both said they look forward to getting back to work inside the orbiting laboratory. Whitson said she's especially looking forward to the view from the station's observation deck-like Cupola, which was added in 2010 and is now the largest window on the space station. "I plan on hanging out in the Cupola window quite a bit," she said. After the launch, the crew will spend two days chasing after the ISS in the Soyuz capsule. By Saturday (Nov. 19), they will arrive at the space station and begin docking at 5 p.m. EST (2200 GMT). There, they'll be greeted by the Expedition 49/50 crew — Shane Kimbrough of NASA and Roscosmos cosmonauts Sergey Ryzhikov and Andrey Borisenko — who arrived at the station in October. Once the Expedition 49/50 crew departs the ISS and returns to Earth in February, Whitson will become commander of the ISS. She will be the first woman to command the space station twice. In 2007, she became the first woman to ever command the space station. A Russian Soyuz rocket sits atop its launchpad at the Baikonur Cosmodrome, Kazakhstan on Nov. 14, 2016, just days ahead of the Nov. 17 launch of three new members of the Expedition 50 crew to the International Space Station. The Expedition 50/51 crewmembers will spend six months inside the orbiting laboratory, where they'll conduct about 250 science experiments. Whitson said she also hopes to do some extravehicular activity, or "spacewalks," during her stay. Correction: An earlier version of this article stated that Thomas Pesquet will be the first French astronaut to visit the ISS. He is not the first French astronaut to fly to the space station. He will be the first French astronaut to participate in an ISS Expedition, which involves an extended stay aboard the space station.